Illinois Gov. J.B. Pritzker speaks at a state Capitol news conference Wednesday, Jan. 23, 2019, in Springfield, Ill., as state Treasurer Michael Frerichs looks on. 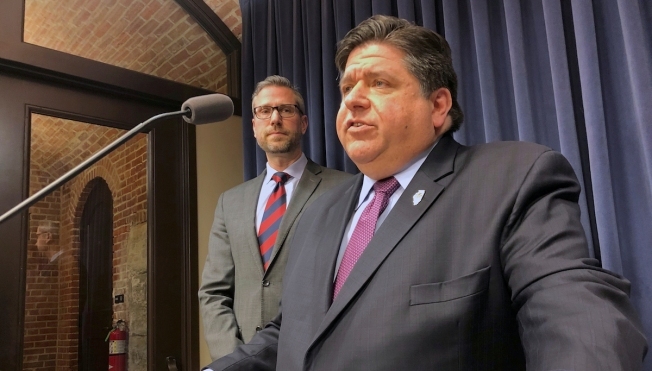 Even though the state of Illinois doesn’t have a horse in the race to host the 2020 Democratic National Convention, Governor J.B. Pritzker does have a city that he hopes crosses the finish line first. The DNC will choose the winner from among the three finalists city soon, with an announcement expected in the coming week. Milwaukee, Houston, and Miami are the three finalists, and Pritzker hopes that Wisconsin’s largest city lands the prize. A convention in Milwaukee would be viewed as a potential win for the Chicago-area, as more than 3,700 delegates are expected to attend. It’s likely that Chicago and the northern suburbs would benefit from the convention, as guests may opt to stay in Illinois hotels and come visit the nation’s third-largest city. This week, Pritzker spoke with Wisconsin Governor Tony Evers to pledge his support. “He wants it in Milwaukee, and offered to help in any way,” Pritzker spokeswoman Jordan Abudayyeh told NBC 5. Wisconsin could be a key swing state in the 2020 presidential election, as it went for President Donald Trump during the 2016 race.